One thing I’ve noticed with my live declutter series is that many women want to clean their homes but they’re not sure how to fit organization in with their already busy schedules. I completely relate – it is not easy to wear all of the Mom hats AND add decluttering to the list! That’s why I decided to put together this book list for you – while there is no magic button, the following books were really helpful to me when I needed to figure out how to make time for organization, and I think they’ll help you, too! Short and sweet, this is a perfect starter book if you’re new to the time-management genre. Like Amy Lynn Andrews says, “What if you could change your life in 30 pages? And for less than the price of a fancy coffee?” Yes, yes, yes! Buy it now and read it today! If you feel like you’re just too busy and don’t know what to do about it, then you must, must, must read this book! 168 Hours truly revolutionized the way I view my time and I haven’t been the same since (in a good way!). This book is perfect for anyone who struggles with timeliness. Since I’m a semi-reformed late person, I get it – being on time is tough! Complete with tips, quotes, embarrassing confessions, and funny success stories (pajama church, anyone?! ), 28 Days to Timeliness is a refreshing balance between informative and inspiring, and will provide you with the knowledge and tools you need to begin your own journey towards timeliness. This book is like having a personal trainer for self discipline! I recommend 21 Days to a More Disciplined Life for anyone who wants to develop more discipline in their own life, for those who find themselves caught up in the comparison trap, or for people who (like me!) tend to come up with a fantastic plan, start out at 100 mph, then crash and burn after two days. The simple chapters are very doable and wonderfully motivating to help the reader make a lasting change. 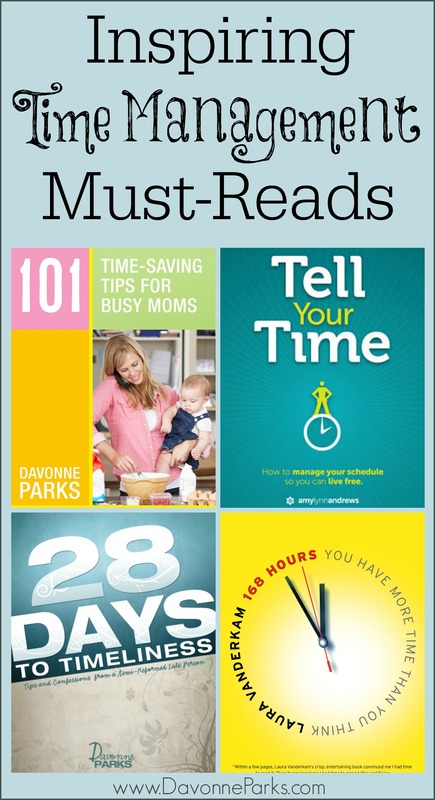 101 Time-Saving Tips for Busy Moms by Davonne Parks. From beauty routines to meal preparation to cleaning and laundry, you’ll find tips in this book to simplify your daily approach. And, whether you’re a car-pooling working mom or a stay-at-home homeschooling mom, 101 Time-Saving Tips includes tips that are sure to benefit you, the busy mom. Best of all, for a limited time only, 101 Time-Saving Tips for Busy Moms is FREE to my blog subscribers! Go here to sign up. « Don’t Forget! Live Declutter is TODAY!